Solar panels have been on houses for 20+ years and are becoming more and more common today due to technology. They may be an important element of the home to an owner as they relate to energy conservation, renewable energy, a person’s desire to live a, “Green” lifestyle, etc. However, the functional value of different types of solar panels can be subjective just like the value of a swimming pool. Some people prefer a home with a pool and some people will not consider purchasing a home with a pool. To each his own as the saying goes. This article will discuss solar panels. I will attempt to identify a couple of different types of solar panel systems that I have seen. I will share the wording of the New Jersey Administrative Code, Chapter 40, Subchapter 15 Rules of the Home Inspector Licensing Act to the degree that it mentions solar equipment. I will also share my opinion on how the rules for home inspections applies (or doesn’t) with regard to solar panels and solar systems. Like other aspects of the home inspection, the inspector may recommend that you have a system or component evaluated by a qualified professional. For example, a licensed plumber should address plumbing problems or concerns. If the electrical panel (circuit breaker panel) seems too small for your plans for the new house, the inspector may suggest having a licensed electrician evaluate your electrical needs and the capacity of the existing system and make recommendations as that electrical professional deems necessary. If there’s an issue with a deck’s structure the inspector may recommend evaluation by an architect or structural engineer. If you are considering purchasing a home with solar panels and you have concerns, it is appropriate to have the solar system inspected by a solar panel expert. Home inspectors are residential house generalists. We may appear to be expert and some inspectors may come from a background of plumbing or general construction but very few are experts in any one field and hardly anyone is even generally knowledgeable when it comes to solar panels. On a side note, I built my first (and only) solar panel back in the late 1970s when I was a teenager. The family pool water was too cold. The solar panel was a wood box that was built to fit a piece of glass that I had. I put a piece of tin, painted black on the bottom. It had a series of plastic pipes (first mistake as the heat wasn’t conducted well in plastic piping) that was coiled inside the box under the glass on top of the tin. I also lacked a pump so I connected a garden hose to one end. The water warmed but didn’t get hot. Oh well. Solar panels are mentioned a couple of times but relating to heating systems and the roof. The photovoltaic solar panels of today weren’t common when the NJAC was written and I am not aware of any updates to the solar technology. So there isn’t any confusion, I have emphasized (all CAPS, underline and bold) important words in the following passages. Unless the inspector has specific, specialized training in the area of solar panels, they should not present themselves as an expert in that field. However, the home buyer may appreciate a general overview or explanation of the solar system’s various elements. I am aware, and have inspected houses with two different types of solar panels. While there are some differences, there are also common elements that the home inspector should be looking for. The general types are solar panels that help heat water and solar panels that generate electricity. Solar thermal panels that help heat water are the original solar panel system. There are panels on the roof that have a set of pipes. A liquid like anti-freeze (not water) flows through the pipes that are inside the panel and exposed to the sun’s rays and heat. There is a small circulating pump that circulates the anti-freeze liquid. Inside the house there is a heat exchanger. A heat exchanger is a device that allows the heat from the sun-warmed anti-freeze liquid to transfer to water either in a water heater or perhaps a radiant floor heating system. In this fashion, heat from the sun can be captured and used to heat the home’s drinking water or to heat the house itself. I would estimate that this type of solar system was used from the late 1970s until the early 2000s. What SHOULD the Inspector Look for? 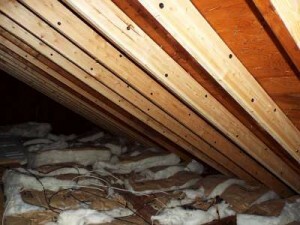 Let’s not forget that the purpose of the inspection is to inspect the house. To prepare a report that describes various systems and components and identifies Material Defects in accordance with the NJAC. The systems and components that might be directly impacted by a solar system include 1) The roof surface material (shingles). 2) The roof structure. 3) The plumbing system and 4) The electrical system. 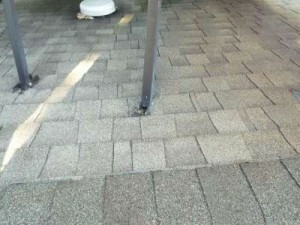 When inspecting the roof the inspector should visually inspect the connection points between the solar panel posts and the roof. Do the connection points appear to compromise the water repellent nature of the roof? Are shingles missing or damaged? Are there screw/bolt holes that will allow water to penetrate inside? The inspector is not inspecting the panels per-se but noting and documenting how the panels impact the roof which is definitely part of the inspection. These photos are from a house in Barnegat, NJ. 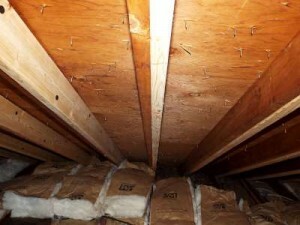 Another area that the inspector may want to look is inside the attic. Most roofs in this area are designed for a snow load. Different areas of the country have different requirements based upon the potential snow fall. Most roofs are not designed to carry a static or dynamic load other than snow. Roofs aren’t designed to hold heavy, static load so often the roof rafters will be bolstered to handle the additional weight of the solar panels. In the photos below one can see that every original (darker colored) roof rafter has been, “Sistered” with a new piece of lumber. The additional roof rafter lumber is specifically installed to help carry the additional weight of the solar panels (plus any snow). According to http://www.civicsolar.com/resource/roof-load-considerations-pv-arrays PV panels can weigh up to 50 pounds each and there are numerous panels on a roof. 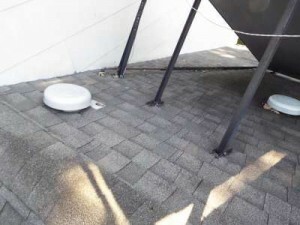 The photos below are from the attic in a house in Eatontown, NJ that had PV panels outside. In neither of these houses were the operation or efficiency of the solar panel systems inspected. I explained the components of the thermal system; Circulating pump, heat exchanger, etc. and pointed out that a replacement water heater that has the heat exchanger coil built in may be considerably more expensive than a common water heater. For the photovoltaic system, the seller had the paperwork from the installer along with the nature of the business deal with the electric company or solar provider. Some PV systems are leased by the homeowner and some are owned. I highly recommend that you understand, 100% the nature of the business arrangement that you are buying into when you purchase a home with a PV system. You should ask the seller for any and all paperwork you have from the PV solar provider. This is something that you may want to have your attorney review. There are numerous business models that the PV supplier and your new, electricity business partner (yes, you may be in a business relationship with the PV contractor to some degree) may have. It’s important to know what your obligations and opportunities are. Most PV systems capture/generate electricity and likely send the generated energy back into the electric grid. I have seen houses with a second meter associated with the PV solar system. Your regular electric meter keeps track of the electricity you use. The second meter, part of the PV system, likely keeps track of the electricity that your PV system generates and sends back into the grid. If you use 10kw of electricity and your PV system generates 4kw, your contract with the energy company may (based on your contract) then require you to only for the net 6kw that you use. Some PV systems may be more sophisticated and also have batteries. If your PV system generates and stores the electricity for your use, there is likely to be a large set of batteries (imagine heavy-duty shelves with dozens of car batteries – we’re not talking D-cell batteries here). Since the batteries are DC electricity and the house uses AC electricity, there will also be an inverter in this sophisticated system. The inverter converts DC to AC. Please note that this is a very specialized application of PV solar panels and definitely requires a specialist to inspect as well as the knowledge that there may be regular maintenance of the batteries. If you’re purchasing a house with, “Solar panels” make sure you understand what type of solar system you have. Thermal? PV? If it’s an older thermal system, you may want to assess its value as there may not be many companies skilled in the thermal systems and the replacement components may be either hard to find or expensive, or both. If it’s a PV system, make sure you understand the nature of the ownership and financial arrangement with whomever installed it and who will be buying the excess energy that you may be returning to the power grid. PLEASE CONSULT AN EXPERT. About the author. 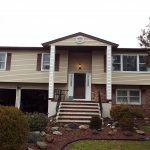 I am a NJ Licensed Home Inspector and have performed over 500 inspections. I am the owner and Inspector at Regal Home Inspections, LLC. 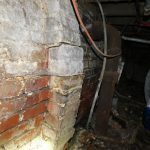 In addition to being a New Jersey Licensed Home Inspector I am also a NJ-DEP certified Radon Measurement Technician and Regal Home Inspections, LLC has also collected samples for lead paint, allergens and mold. We are affiliated with the best labs that perform the sample evaluation and testing. We can also help facilitate the testing of septic system and numerous aspects of oil tank evaluations. This includes oil tank integrity testing, tank locate services and soil samples. We work to ensure that the house you’re buying is sound or that you know of any issues.